Is there a record of any other person in antiquity whose love of children and interest in them equalled that of Jesus? His love was such that he held up a small child as an example that adults must, in some way, choose to resemble. This is a bold challenge, and yet Jesus’ references to childhood are all too easily sentimentalized. Jesus is indeed full of compassion and love, but he stands in the truth, and his compassion and love express themselves in hard, almost ruthless sayings and demands. Familiarity with Scripture can blunt this sharp edge. We must learn not to take these challenges lightly. Jesus’ disciples left the security of family, home and livelihood to throw in their lot with Jesus. 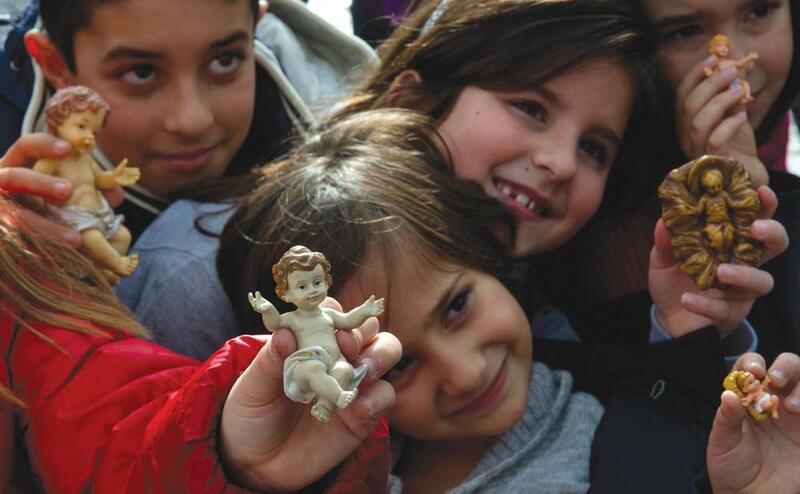 In regard to this world, they are poor and powerless, little ones of no account, and Jesus is grateful for their loyalty and courage. However, he has no illusions: their self-interest has merely shifted from this world to the mysterious kingdom that their master is inaugurating. What gleaming crown awaits them? To reach a deep understanding of this “hard saying,” we have to ask what Jesus means by the kingdom of heaven. He is not talking only about the heaven awaiting us when we die; he is talking about the now. In his own historical context, he understands that the work his Father has given him to do is to draw Israel back to God, to renew it and shape it to become all that God intended it to be for the salvation of the nations. In his person the reign of God begins. “I believe in one God,” we say in the Nicene Creed. But in every human heart without exception, God has a rival in the ego. No one can serve two gods at one time. Jesus tells us that it is impossible to see the kingdom, let alone receive or enter it, without a radical renunciation of our natural self-possession and instinctive self-glorification. Given the world as it is, given the way we are, God’s kingdom cannot come without renunciation and suffering. Only our Creator knows who and what we are and the glory and blessedness God destines for us. On our own we cannot know any of this and certainly cannot achieve our proper fulfillment. It can come about only by self-surrender in total trust to our Creator, doing God’s will, which has no other object than our blessedness. As I understand, there are two major effects of the Fall: spiritual blindness and the terror inevitable to our condition of contingency, blind as we are to the protective, nurturing, utterly faithful love of our Creator, in whom we live and move and have our being. We instinctively dread the loss of “me,” of who I am, my “self”; we dread diminishment, dwindling into nothingness and unimportance. To a great extent, nature has ways of anaesthetizing this painful awareness. It persists nevertheless and irresistibly urges us to protect with all our might this fragile self. We are told that we must assert our supposed independence, be ourselves the arbiters of what is happiness and glory and go for it. We are desperate to keep control; we watch lest others threaten our rights. In other words, we insist on being our own god. Good, noble, virtuous in all manner of ways, we remain in control. We believe there is no problem in giving generously of the fruits of our vineyard, so long as the vineyard remains our own. And yet it is precisely this jealously guarded self-possession that must be surrendered. I do not think that we ourselves can make this absolute surrender. God himself must do it for us, must wrest us from ourselves. Nevertheless, if God is to achieve this ultimate triumph, we must do all that is within our power to help. “The Son of Man came, not to be served but to serve, and to give his life as a ransom for many” (Mt 20:28). Jesus himself, the humblest of humankind, is the model for what he is asking of his disciples. Mark’s picture of Jesus holding the child close to him illustrates the point. Jesus is the perfection of spiritual childhood. The stringent unless of turning and becoming as a child in order to enter the kingdom of heaven is another way of saying that to seek to save one’s life in this world is to lose it. To sacrifice one’s life is to gain admittance into the kingdom of heaven. In Ascent of Mount Carmel, St. John of the Cross wrote: “Oh that someone might show us how to understand, practice and experience what this counsel is which our Saviour here gives us concerning the denial of ourselves, so that spiritual persons might see in how different a way they should conduct themselves upon this road than that which many of them think proper.... Oh that someone would tell us how far Our Lord desires this self-denial to be carried!” This lament is addressed to us “spiritual persons,” who claim to be Christ’s friends. What Jesus asks is always possible. The stern, uncompromising injunction to “deny thyself” is not a call to strip ourselves of earthly goods, to take on a life of rigid austerity—the ego could grow fat on that sort of thing. It is not things but self that has to be denied. Our Lord addresses each one of us in our particularity. There can be no pattern. We must want to follow him, want what he wants for us and died to give us. Enlightenment is progressive. Once we really give our attention to the matter, we see more and more how powerful, how tenacious is our selfishness. Every day offers small occasions for surrendering self-interest, our own convenience and wishes for the sake of others; for accepting without fuss the disappointments, annoyances, setbacks, humiliations that frequently come our way. The battle is largely fought out in relations with other people. “By this we know love, that [Jesus] laid down his life for us; and we ought to lay down our lives for one another” (1 Jn 3:16). Although Jesus’ word is addressed to all, historically his words often were addressed to those who were chosen to hold authority in the community he was creating, preoccupied as they were with precedence. There is nothing more contemptible than arrogant abuse of spiritual authority, and surely it is sacrilegious to use what has been given for the service of others to further self-interest. A careful, heart-searching reading of the Gospels and the New Testament letters is indispensable. Be servants of one another, we are told. Consider other people’s welfare rather than your own. Think of yourself as unimportant and other people and the reign of God all-important. Get rid of all anger and bitterness. Watch! Pay attention to thoughts, words, behavior. We soon realize how difficult it is to get rid of our innate self-centeredness. We find our ego lurking behind even our most generous efforts. Paradoxically, to accept humbly and trustfully the impurity of our motives, seeing ourselves far from the loving selfless person we would like to be, is choosing to be little, admitting our helplessness and unimportance—provided, of course, that we are doing our utmost. Childlike, we surrender our autonomy to our Lord who, we now see, must do everything for us, and we find a happy freedom in the knowledge that he is everything we are not and he is all for us. When we no longer insist on being god to ourselves, every one of our doors is thrown open to the king of glory. Our sustained, earnest effort is important, but what God does is infinitely more important and decisive. Genuine prayer—how poor and unsatisfactory it can seem!—never inflates the ego but always induces humility, revealing as it does our spiritual helplessness and dependence on grace. Patience, meekness, a lowly opinion of self and deep respect for others must always characterize the people God has chosen for his own. The Gospel of John shows us the inner reality of the Father’s perfect child. “The Son can do nothing of his own accord, but only what he sees his Father doing” (5:19). Jesus joyfully accepts to be powerless so that his Father can be all in him, and thus he is the perfect human expression of the Father. Through Jesus’ surrender the Father can achieve his loving purpose for humankind: “I do always the things that please him” (8:29). You seem to confuse suicide with salvation. "If you give up your body to be burned and yet have not love," how does that end: "it profits you not." I have a brother, a lawyer, and a friend, a prison guard, who are as different as night and day, except that it turns out they both habitually get about, as they told me when we chanced to be together, five hours of sleep a night. It reminds me of reading of some monastic discipline, one feature of which was sleep-deprivation. This seems to have the effect on the ego/imagination/self-image of a sturdy devotion to absurdity. "Credo quia absurdum est." I myself remember coming back from two weeks' annual military training with a bunch of crazed cooks and always needing about three weeks to come back to a gentle, non-doctrinaire outlook. How do you distinguish peace from sedation? Someone defined a good family reunion, as an example of shalom, as being raucous and conflict-filled. It is the price of community to have many squabbles and disputes. The alternative is lonely conformity to absurd rules--a phenomenon we can see in this Global War On Terror even in mass-organizations. I make a joke about a worker in the Pentagon, the US Military HQ in Washington: "I know nothing, but we know everything." There is a spiritual dimension to that. Or rather, an anti-spiritual dimension. Break forth to the here and now! "Be opened!" Reek of life! It’s pretty hard to lose one’s self since the “self” is so pervasive. Somehow according to Jesus who always speaks truth even after doing all we can in a given situation and perhaps solving complexities, we are to look upon ourselves as “unprofitable servants!” That’s hard to do. But that’s exactly how little children behave, effacingly doing as told, content with their insignificance into their marrow! Somewhat I suspect like Jesus, content with the insignificance of humanity compared to Divinity, to the point where according to St. Paul Jesus didn’t see Divinity as something to be “grasped at” but becoming “empty” like a servant showed the way to go. Servants are like little children who come, or go, do as they are told by command. We’re call to that same spiritual mindset, not easy. Christianity for sure is no cream puff religion! God, over and over again, exercised Divine preferential option for littleness, clearly seen in material creation. Consider for example the millions of flaming orbs spinning throughout the incalculable vastness of the cosmos, yet God chose an insignificant speck of cosmic dust we call “earth” as the launching pad of Redemption. The examples are many and in the world of seeds very apparent. Take for example the giant Sequoias of Northern California, also called “Red Woods.” Some of these giants tower two hundred feet tall and were saplings when Jesus walked the earth. Amazingly they root productively only ten feet into the soil, from seed weighing 1/5000th of an ounce! How much power, grandeur and majesty God packaged into littleness! Study also the lives of saints. Look at the grand littleness of Francis of Assisi, Therese of Liseux, Dominic Savio, the children of Fatima and Bernadette of Lourdes, others, all giants of holiness wrapped in the grandeur of littleness. They were successful in losing self, verifying Jesus’ insight into true greatness in such words as “Thank you Father, for having revealed to little ones what you have hidden from the wise …” and also, “Unless you become as a little child you shall not enter the Kingdom of Heaven.” All of this and more a hard crust of bread to chew, but as evidence asserts, doable. I’m still trying to be spiritually childlike and intend to keep trying to the end. If I have it right I think that's what Baptism mandates. Yes Sister, Yes. "Give us this day our daily bread." This sums up the attitude we are to have. Complete reliance of God for our daily existence. No surplus, no savings, nothing but a state of desperate but "faith-full" dependence. God allows so many things to happen to and for us to strip the ego of its power and wear down our pride. Death of a spouse or child or sibling. Job loss. Financial problems, health problems, mental illness. Why? Why suffering? To bring us, literally to our knees. This article also appeared in print, under the headline "Lose Yourself," in the December 23-30, 2013 issue. Ruth Burrows is the pen name of Sister Rachel, O.C.D., a nun of the Carmelite monastery at Quidenham in Norwich, England.